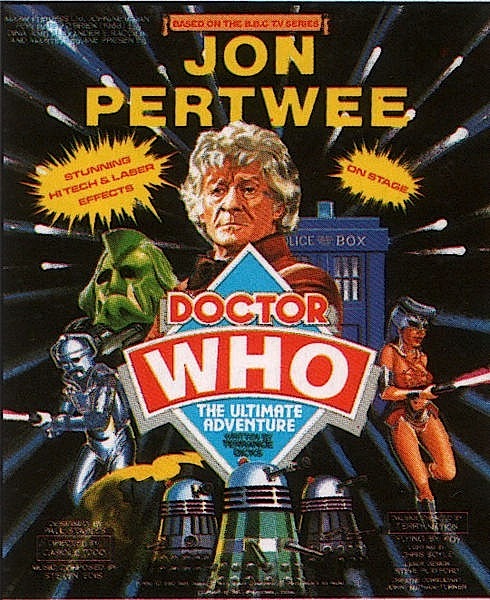 So far I have had a thorough look at the costume combinations worn by Jon Pertwee as the Third Doctor, covering his appearances season-by-season, then in a summary of smoking jackets and inverness capees. But what about after 1975 . . . 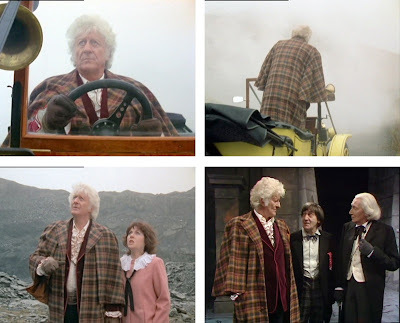 Following his departure as The Doctor, there were a few more occasions when he donned the velvet smoking jacket and inverness cape. For his first and only return to the role within the official series run, he wore a dark burgundy velvet smoking jacket, with rolled collar and cord-piped edges; a brown tartan Inverness Cape; frilled white shirt; no cravat or tie (see below). None of this costume was any of the pieces he wore in his original run. 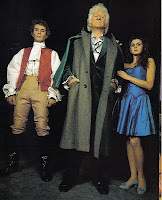 The tartan Inverness Cape is not the one first worn in The Curse Of Peladon (see below, left). Note that The Five Doctors cape has two wings (see above, top right), and not a single cloak spanning the back as (see below, left). Neither is it the one worn only in Invasion of the Dinosaurs, which was a grey coloured tartan (see below, right). This is a bit of an oddity. 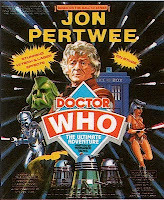 When Jon Pertwee took to the stage in the 1989 Ultimate Adventure (see left), he wore a one-off grey Inverness Cape with a green lining over a dark green velvet Smoking Jacket. While researching this, I found a great little website for the play. It’s written and designed as if it was something happening this year, not over 20 years ago! It is packed with info, cast listings, behind the scenes photos and tour dates. Well worth a look. Around 1989 a velvet smoking jacket was made for Jon Pertwee to use for his various convention appearances. 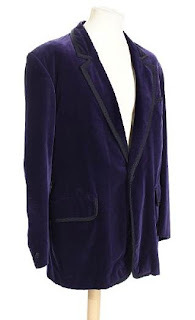 It was made of purple velvet with a notched black piped collar and frog fastening (see right). 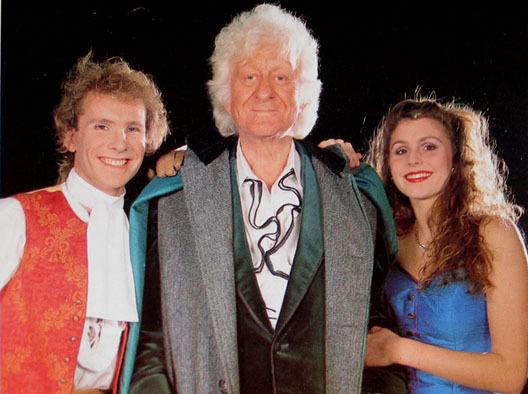 In fact he is technically seen wearing this jacket more than any of his other jackets from the original series and post 1986, it was rare to see Jon not wearing it! 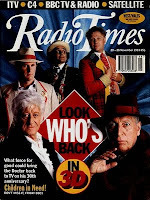 He wore it for his appearance in the 1993 30th anniversary Children In Need special Dimensions in Time, and appeared on the front cover of the Radio Times for that week, along with all the other surviving actors to play The Doctor (see left). He also wore it at the following opportunities: BBC Video The Troughton Years, BBC Video The Pertwee Years (see below), More Than 30 Years in the Tardis, Return to Devils End, Reverse the Polarity, Noel’s House Party. He also wore it for the photo-shoot used for the covers of the BBC Radio dramas The Paradise of Death and The Ghosts of N Space (see left). 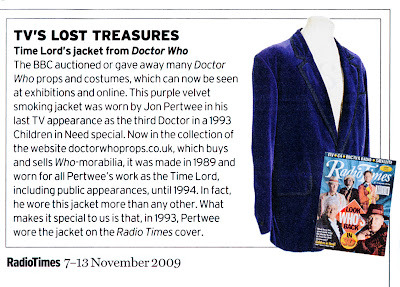 The jacket was sold in 1994 to a private collector, with a letter from Jon Pertwee detailing the sale. More recently it came up for sale again at the Bonhams Auction in June 2009, where it was sold for £5,400.